Designed to take ground hits from ruts & potholes. The Remoras is a Hanging Magnet Designed to Take a Hit. 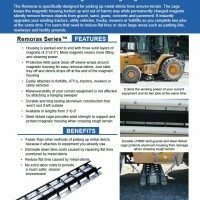 The Remoras is specifically designed to withstand frequent ground hits while picking up metal debris from uneven and rough surfaces with potholes and ruts, etc. A protective cage keeps the magnetic housing tucked up and out of harms way while it removes ferrous metal objects from the ground with bumps, ruts and potholes that would cause the hanging magnet to experience frequent direct ground strikes. The Remoras attaches to equipment you already own so you can complete two tasks at the same time. 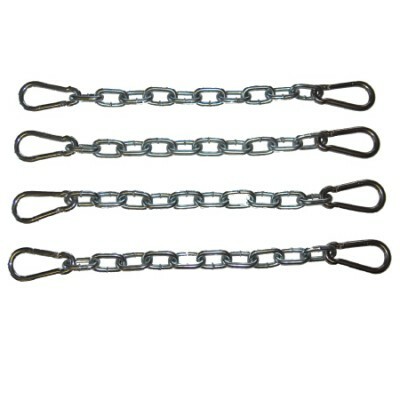 Comes standard with 4 hanging chains and a Quick Clean Off Sleeve allowing magnet clean off in seconds and in one pile at the side of the magnet. Ideal for Mounting Under Equipment Where Ground Conditions May Be Rough and The Magnet May Take a Hit. "Picks up metal from as far as 8 and 1/2” below and barely any falls off when a large bump is hit." A Hanging Magnet Designed for Uneven, Rough Terrain. 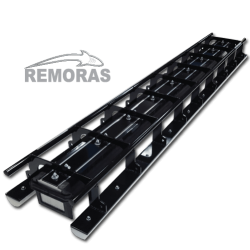 The Remoras was specifically designed to be attached to outdoor forklifts, graders or other equipment that operate in gravel or dirt yards with severe ruts and potholes due to the equipment use, and whose yards also have debris problems that are causing flat tires. The Remoras allows equipment operators to do their normal jobs while at the same time keeping the whole area clean of debris that would otherwise be causing flats on the equipment being operated or other vehicle traffic. Manoeuverability of your current equipment is not affected by attaching a hanging sweeper. It’s just too easy to do two jobs at the same time, saving money as well. Steel ribbed cage provides solid strength to support and protect magnetic housing. 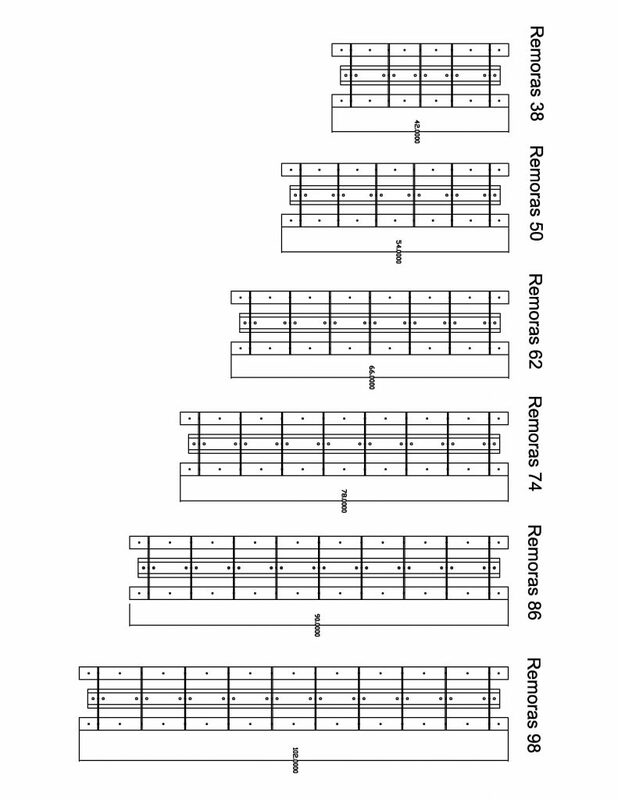 End view of the Remoras shows the cage dimensions in inches. The length measurements on all the units. 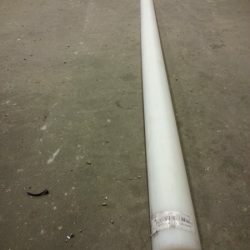 PVC Quick Clean Off Sleeve makes cleaning metal debris off of the magnet easy. The Sleeve wraps around magnetic housing and slides off to remove debris. Simply unclip the Sleeve, slide it off the magnet, and debris falls to the ground. UHMW skid bars on bottom are the same material that motorcycle chain wear parts and tensioners are made from. These runners are incredibly durable and could be scuffed along the ground an extremely long time before ever wearing out. The Remoras comes standard with a Hanging Kit so you can attach the sweeper to your equipment. The kit includes 4 strong 1/4″ grade 30 zinc plated chains and galvanized security snaps for hanging the Remoras magnet to your equipment. Maximum pickup height – 8 ½” (using a two and a half inch nail). UHMW skid bars on bottom. Comes standard with Hanging Kit. Comes standard with protective PVC quick clean off sleeve. Steel ribbed cage provides solid protection. Comes in 6 different magnet widths from 3 to 8 feet. Magnet works great. We wanted to mount it to the front of one of our Peterbilt yard jockey trucks but it did not have the proper mounting brackets. We made it work on one of our other trucks though. Picks up metal from as far as 8” below and barely any falls off when a large bump is hit.